What is Distributed Control System ? There are many definitions of distributed control, but the basic concept is always the same: divide a large application into multiple smaller subsystems, each of which carries out a portion of the application, and allow these subsystems to communicate with one another. Distributed control systems have evolved from two older technologies — direct digital control, and hybrid control made up of discrete devices. 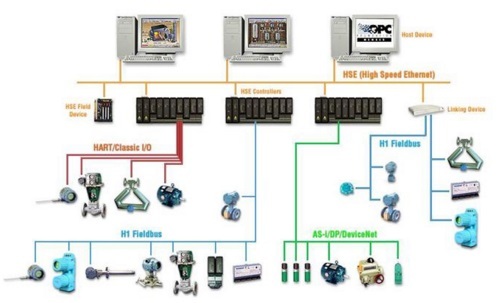 Hybrid control systems include individual discrete-control hardware, typically programmable logic controllers (PLCs) or analog loop controllers, and a computer to collect process information and generate management reports. Panel-board instrumentation, located in a central control room, is typically used as the operator interface. While hybrid control systems offer distributed hardware, they do have problems: Each system is custom-designed using controllers made by different vendors, making interfacing difficult. In order to expand a system, specialists in several different technologies are required. Actual control is usually done using an analog controller, which suffers the familiar problem of drift. Installations typically take a long time, due to complexities in interfacing various subsystems together. Because several subsystems are linked, system response is slow and unpredictable. And, lack of a central database makes decision-making more complex. Direct digital control solves many of the interfacing problems of hybrid control. Using a computer to control an entire process allows information to be collected and reported quickly. A major disadvantage of this approach is that the computer represents a vulnerable point — the entire process could shut down if the computer fails. Redundant control systems that consist of either a second computer or analog instruments are usually installed to protect against a total system shutdown, but these backups add greatly to the cost and complexity of the control. With the advent of the microprocessor, true distributed-control systems became practical. This approach to problem-solving combines the best features of hybrid control systems and direct digital control. It allows the application to be broken into subsystems that use digital, rather than analog, control techniques and that can be interfaced together easily. These systems can easily be expanded to accommodate future plant requirements and to take advantage of the latest control technologies. (I/O) devices, individual controllers (such as PLCs and loop controllers), operator interfaces (such as color CRT cathode ray tube screens), computers for data manipulation, engineering workstations, and communication networks for remote and local information exchange. An important concept in distributed control is that of breaking down the software program into logical pieces, independent of system hardware. Doing this makes system design much more efficient, since programs are smaller and, therefore, easier to write, debug and maintain than the larger programs in computer and PLC systems. This concept is known as multitasking. It allows multiple small programs to run on a single processor in a priority-structured manner, which ensures that system response will be repeatable. Because a system can be broken down into subsections that communicate freely with one another, DCS makes the design, implementation and maintenance of complex control strategies easier. Although simpler design and (to some extent) implementation appear to benefit primarily the DCS supplier, the user also benefits — from shorter leadtimes, simpler systems, improved reliability, reduced downtime, reduced installation costs due to wire savings, and greater flexibility to make future enhancements. Ideally, the DCS will use common hardware throughout. This simplifies the design, since the programming methods and documentation become independent of the subsection that is being designed. If the DCS is well designed, the engineer has a great deal of freedom to construct the system in a logical manner, taking into consideration the effects of single-point failures on the operation of the process. Unlike control systems based on other strategies, the DCS can continue to operate in a semiautomatic mode when one control section fails. The process can be kept operational while the failed section is repaired, although the process may operate at less than peak efficiency. What is the function of Magnetic Contactors ?